We bring artistry back to outdoor lighting. We will give you a landscape lighting demo prior to starting and offer a lifetime warranty. Competitively priced. Servicing Buffalo Grove IL area. 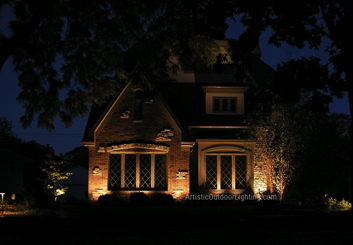 We are your premier source for landscape lighting and outdoor lighting Buffalo Grove IL. As 5-time Angie's List award winners serving you for 18 years, we offer 10 year guarantees on all installations and a free in-yard demonstration. We are experts in LED outdoor and landscape lighting and offer the highest level of attention to detail. It's been proven that when intruders see light, they move on to a darker home. Artistic Outdoor Lighting will not only enhance the beauty of your home and property, but your Buffalo Grove IL landscape lighting will get the added benefit of security. Feeling safe and secure, especially when you are home alone, is priceless. Also, the ambient light around your home will make paths and walkways safer for you, your family, and guests. Contact us now and let us show you how we can enhance the beauty and safety of your home and outdoor spaces. We will set up a complete, detailed demonstration that will duplicate exactly the way the final lighting installation will look. There is no guesswork. What you see is really what you get. At the time of the demonstration, diagrams, wiring charts, and photos will be made to ensure exact duplication at the time of installation. No other company goes to these lengths and pays as much attention to Buffalo Grove IL outdoor lighting detail. We also offer the latest in energy efficient landscape lighting, including LED and fluorescent lighting installation, ensuring that you continue to get the most cost effective lighting available. During the summer, Buffalo Grove hosts two festivals. The Buffalo Grove Invitational Fine Arts Festival is held in Buffalo Grove Town Center in mid-July, with over 30,000 visitors attending on average. In September, Buffalo Grove hosts the multi-day Buffalo Grove Days festival around the intersection of Lake-Cook Road and Raupp Boulevard. The festival is mostly home to carnival games, roller coaster rides, arts and craft booths, food vendors, and live music. There is a parade held at the beginning of the festival and fireworks on the Saturday night. The festival usually attracts not just Buffalo Grove residents, but also residents from the neighboring communities. Throughout the summer Buffalo Grove hosts a Farmer's Market at the Spray and Play Pool on McHenry Road west of the intersection of Buffalo Grove Road. Buffalo Grove is home to other places such as the K1 Speed. We provide service throughout Buffalo Grove IL, including 60061, 60069.